“What’s in the box?” No, it wasn’t Brad Pitt’s scene from Seven, but the scene unfolding in my living room. A gift had arrived from Harry & David, and Robin was dying to know what we got. 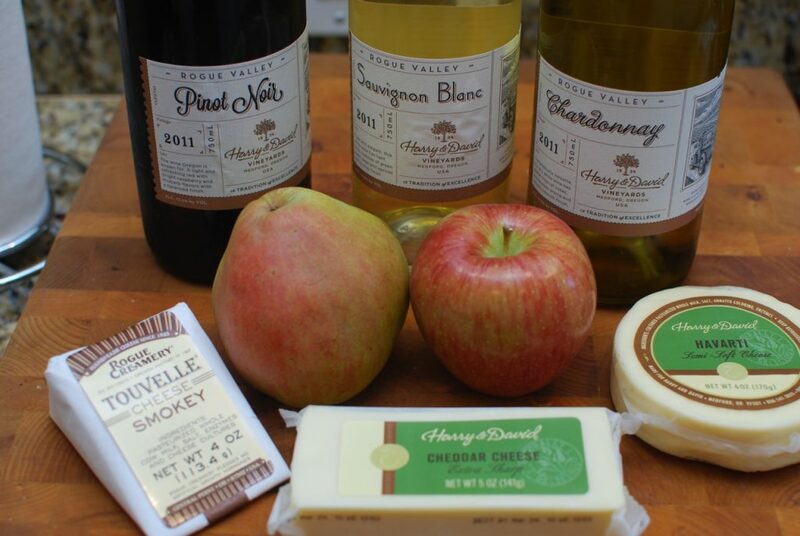 Ever since I partnered with gift great Harry & David to review their Fruit and Cheese of the Month club, and pair it with wine of course, we’ve been on pins and needles to see what was coming. We couldn’t wait to try everything out, as well as offer one of their fantastic gifts of fruit and cheese to you as a giveaway. I’ve always been a fan and customer of their delicious fruits and goodies, but after visiting Harry & David’s orchards and operations in October, I feel even more strongly about the company. 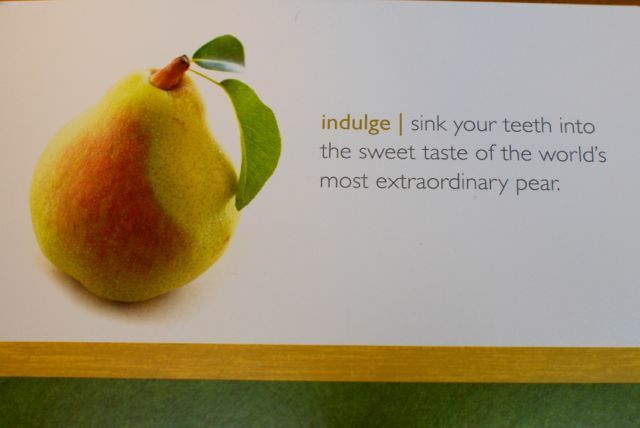 It’s no secret that Harry & David offer some of the most delicious pears you’ll ever sink your teeth into. They are not only the sweetest and juiciest I’ve ever tasted, but their color and texture is amazing. Their other fruit gifts are equally as delicious, and they’ve partnered with great cheese companies to give you amazing wine pairing options. Couple that with the new line of wine from Harry & David and you’ve got amazing gift options, or a perfect picnic or party delivered right to your door. The gift I received was a sample of what you can expect when you order a gift of Harry & David’s Fruit and Cheese of the Month. The giveaway, details are below, will be three months of their fantastic fruit, paired with an artisan cheese delivered to your door. It’s an amazing gift idea, something new and exciting each month it arrives. 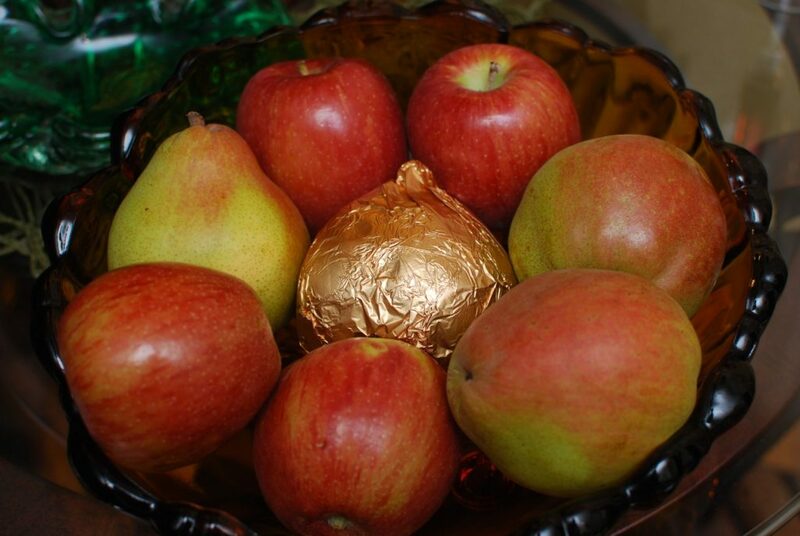 From their Royal Riviera Pears to their Honeycrisp Apples, my favorite apples ever, you will savor each and every bite. The cheeses are amazing options like Rogue Creamery Touvelle Smokey cheese or their own Cheddar cheese which is creamy and delicious. While this is a sponsored post, I’ve always been a put your money where your mouth is kind of person. I couldn’t in good conscious recommend and write about something I wouldn’t pay my own money for. I’ve been a long time customer of Harry & David, sending their pears and other gifts to people all the time. The nurses who’ve been helping my sister recover for the last year have been delighted to recieve a gift of Harry & David’s fresh fruit, and of course go wild over the MooseMunch. I even sent a bunch of goodies to Robin’s mom this past Thanksgiving, including two boxes of Harry & David’s Royal Riviera Pears. 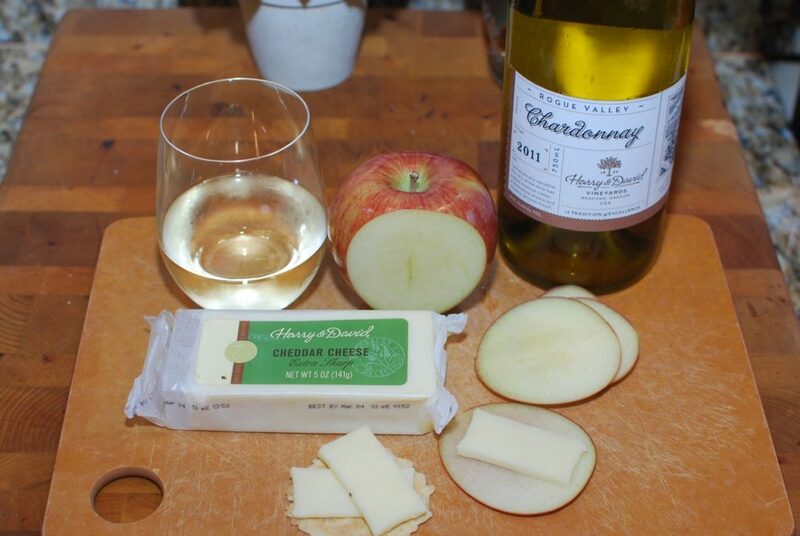 I first paired the Harry & David Honeycrisp apple, topped with a slice of their delicious aged cheddar with the 2011 Rogue Valley Chardonnay, also from Harry & David. 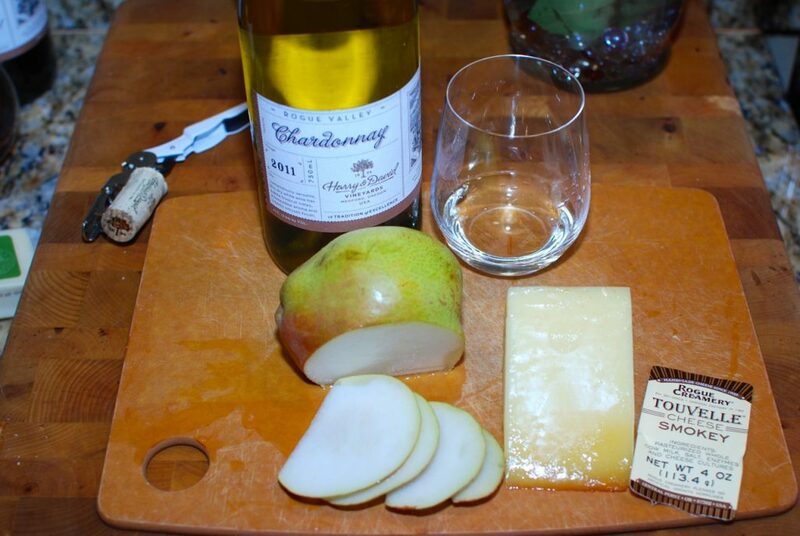 Chardonnay pairs so nicely with cheddar cheese, and of course the apples topped with the delicious creamy cheddar is a perfect pairing too. However, the apple was a tad too sweet for the chardonnay! So, I ate the apple, then the cheese separately and finished with the delicious, crisp white wine and was very happy. The Harry & David chardonnay is bursting with fresh crisp flavors of pear and apple, has a nice body and enough acidity to make it food friendly. You can order three white wines from Harry and David, and I think the Gewurztraminer would work perfectly with the sweet apples as well as the cheddar. The Harry & David Royal Riviera Pears were super sweet and super juicy. I put a slice of the Rogue Creamery Touvelle Smokey cheese on top, and it was an interesting mix of sweet and savory. The pears were WAY too sweet for the chardonnay, and would have gone much better with their viognier, or even the gewurztraminer. The fruit needs a sweeter, more fruit forward wine. The cheese was very smokey, even the tip of it was a dark smoked color. It was very unique, and it paired nicely with the Chardonnay as well. And now, you have the chance to win three months of Harry & David’s Fruit and Cheese of the Month club! 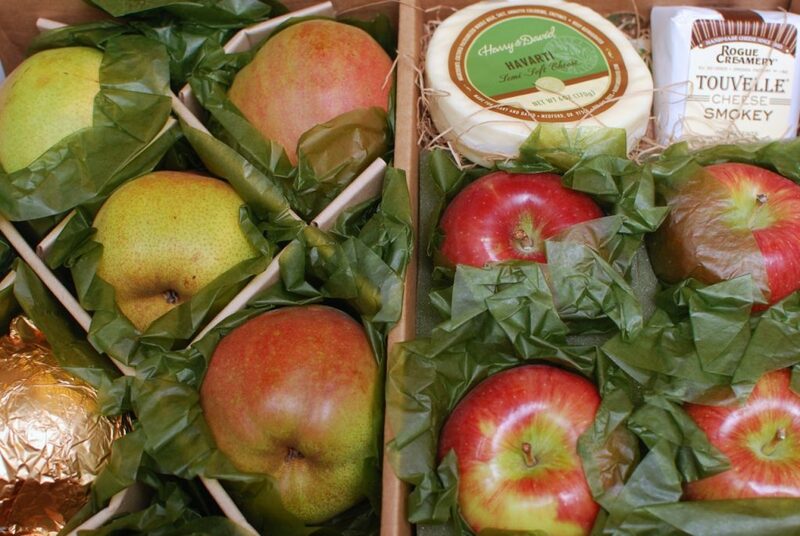 A $130 value, you will receive their Royal Riviera Pears and Mascarpone cheese for the December shipment. Then the January Shipment will be Cushman’s HoneyBells and Mt. Townsend Seastack cheese. Finally, your great gift wraps up with Royal Oranges and Beechers Flagship Cheese. The Pears and Mascarpone will pair perfectly with a Moscato d’Asti, or even a sweeter, Oregon Riesling. The Honeybell Oranges will also pair well with sweeter wines, riesling, moscato or even Sauternes, while the Seastack cheese should match nicely with pinot noir or chardonnay. Finally, your Royal Oranges pair with the same wines the Honeybell will, and the Beechers Flagship should be nice with Syrah or Chardonnay. Entering the giveaway is simple. You have from Thursday December 13th through Sunday December 16th 11:59 pm EST to enter. Each person can enter up to three times, one for Facebook, one for Twitter, and one for Pinterest. For each entry, you must leave a SEPARATE COMMENT below. Make sure I have your email address, as the winner will be selected at random based on the comments below, and notified by email only. This contest is open to US residents only, and if you live in a state where Harry & David can not ship wine, an alternate gift will be made available as necessary. In the mean time, I have some delicious fruit to enjoy. Cheers!